The 2008 Slam Dunk Competition was high on gimmicks, the two biggest being Gerald Green blowing the candle out on a birthday cake positioned behind the rim and Dwight Howard dunking in a Superman outfit. These were okay. There’s a place for these dunks. But the real highlight for me was Dwight Howard’s first dunk in the final round where he lobs the ball, then taps it off the backboard with one hand and slams it with the other. That is something I’ve never seen before. Which is saying something after twenty odd years of the dunk competition (a concept not confined to the NBA). And it was without gimmickry. But if he had done it without his shoes on (a la Green’s last dunk) it would have been even better. For those interested, you can watch all the dunks here: round one, round two, finals. I think it’s sad the whole competition only consisted of twelve dunks. Some of these athletes only have small window where they have maximum hops and aren’t barred by their teams from competing (because they’re too important to get injured) and it would be a shame if Travis Outlaw’s time came and went without him getting a go. I think there is some sort of parallel to be drawn between trying to come up with a new dunk and trying to come up with a new story (another area where it’s all been done before) but I’ve sworn off using basketball similes in my writing, and I guess that applies here too. We are now at the end of the seventh week of 2008. Only one week left in February. Some days I think this year is whizzing by, others I think I’ve found the perfect way to slow time down (sit at a computer every minute of your “free” time). I thought I’d fallen into a rhythm over the first three weeks of working: struggle to reach 2,000 words a day during the week then make up for it in the weekend. But this week it was different. I managed to start the working week on fire (buoyed by some good news re: stories getting accepted for publication), tailed off a bit, then had my worst day (words-wise) on a Saturday. 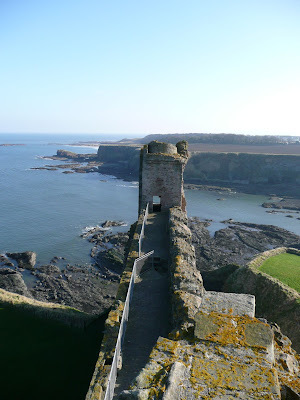 Excuse: it was a beautiful day so we went to Tantallon Castle (photo below). Taking a positive spin on this: there is more than one way to go about this million words.